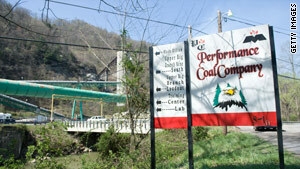 An explosion at West Virginia's Upper Big Branch coal mine killed at least 25 people. 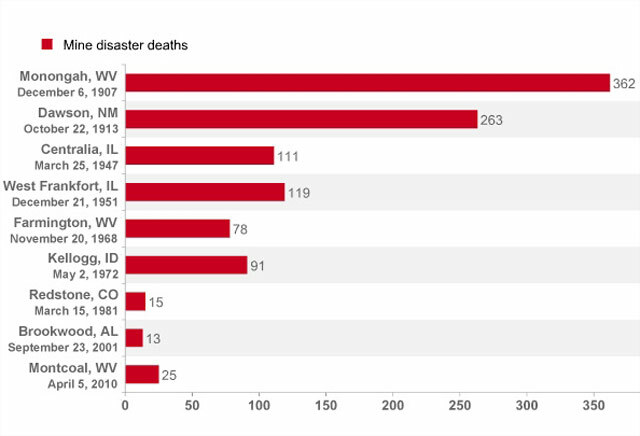 Naoma, West Virginia (CNN) -- Two West Virginia mining accidents within 17 days in January 2006 killed 14 people and prompted Congress to pass the most sweeping mine safety legislation in 29 years. The Mine Improvement and New Emergency Response (MINER) Act of 2006, along with tougher policies subsequently adopted by federal regulators, helped reduce mining fatalities to record low levels from 2007-2009. Now, another West Virginia mine explosion that killed at least 25 miners raises questions on how such a disaster could happen after all the congressional hearings, enhanced policies and industry commitments to prioritize worker safety. "We were hoping that nothing like this would every happen again," said R. Larry Grayson, a Penn State energy and mineral engineering professor who headed an industry-funded commission that issued comprehensive safety recommendations after the 2006 tragedies. "We've done all this technology, we've done all this think-tank stuff," Grayson told CNN on Thursday. "It really just rips everybody apart, not just the families, everybody" in mining. The MINER Act focused on responding to emergencies to prevent a reoccurrence of the Sago Mine tragedy of 2006 in which 12 of 13 trapped West Virginia miners died before rescuers could reach them. It required mining companies to improve communications systems, have rescue teams ready for immediate deployment and install underground chambers for trapped miners to seek out to await rescue. The law also increased fines for companies that failed to immediately report a hazardous incident or committed safety violations. Chart: Mine disasters in the U.S.
After the law was enacted by then-President George W. Bush in June 2006, the federal Mine Safety and Health Administration (MSHA) implemented new regulations with tougher fines and with the intent of enforcing a longstanding power to identify and shut down chronic safety offenders. However, mine experts interviewed by CNN said the MINER Act and the MSHA regulations have proven insufficient to crack down on chronic offenders. One reason is an apparent loophole in MSHA policy that allows mining companies cited for violations to avoid being designated as multiple offenders facing a government-ordered shutdown. MSHA looks at citations over the previous two years to determine whether a pattern of safety violations exists. If it determines such a pattern, MSHA can then begin steps to shut down a mine or a particular part of a mine where the violations have occurred. The problem, experts say, is that MSHA only considers final citations -- those that have completed the potentially lengthy administrative and legal process. While mine operators are compelled to quickly abate any safety violations, they can appeal particularly troublesome citations and subsequent fines to delay final resolution of them until after the expiration of MSHA's two-year window for consideration. Tony Oppegard, a Kentucky mine safety expert who formerly worked for the MSHA, said stricter enforcement of the so-called "pattern of violations" regulation could have prevented the latest tragedy. The Upper Big Branch Mine operated by Massey Energy "would have been on a pattern a long time ago" due to multiple citations for severe safety violations, according to Oppegard. "If that mine is not placed on a pattern, there's not a mine in the country that would be," Oppegard said. Massey officials didn't immediately return calls from CNN on Thursday. However, CEO Don Blankenship has defended his company's safety record this week, saying Massey's mines "are typically in better shape than others that are in our area or in the country. ... Our creativity on safety is second to none." Celeste Monforton, a George Washington University occupational health professor, said some mine operators exploit the loophole in MSHA policy by creating "litigation limbo" so that cited violations remain unresolved beyond the agency's two-year window. "It's my opinion that they're gaming the system," Monforton said. Statistics show that the number and percentage of citations appealed have increased greatly since the MINER Act was passed and MSHA toughened its policies, causing a backlog of cases. Joe Main, the assistant Labor Secretary for Mine Health and Safety, testified before the House Education and Labor Committee in February that the current backlog is 82,000 contested violations with $210 million in contested penalties. In 2005, mine operators contested 6 percent of the 128,000 cited violations, while last year, they contested 27 percent of the 175,000 cited violations, Main said. In addition, the number of citations contested in 2009 more than doubled the number that became final, Main said. "While most mine operators do not file notices of contest, a few operators are contesting a large percentage of their violations and proposed penalties, with some operators contesting up to 100 percent of the citations and proposed penalties they receive," Main testified. Oppegard noted that the MINER Act invited increased appeals because of the larger fines. "They were right in imposing stiffer penalties. To me, it's understandable the industry would contest them," Oppegard said. "Rather than place blame on industry, Congress needs to put aside more money for appellate judges (to process the appeals). Industry shouldn't be faulted for using their rights." At the congressional hearing in February, a representative of the industry's National Mining Association said that appealing cited violations has no impact on mine safety. Bruce Watzman, the group's senior vice president for regulatory affairs, noted that the citation process requires mine operators to abate safety violations prior to the appeal process. Officials said an investigation of what caused Monday's explosion in Naoma will shed light on whether deficiencies in the MINER act or MSHA regulations were a contributing factor. At the same time, increased funding and better enforcement by MSHA will help the mining regulatory system, said Rep. Nick Rahall, D-West Virginia. "I believe we have a new MSHA now as opposed to the old MSHA where there was lax training, where there were budget cuts, where there were alleged cozy relationships between inspectors and the industry, with those inspectors looking for a job later in their career in the industry," Rahall said. Eric Snyder, a Charleston-based attorney who has often represented coal miners, said the recent mine disaster showed the continued need for strong regulation. "A disaster like this is hard for me to believe in a modern coal mine if everybody is following the rules," Snyder said. Grayson's commission, which issued its report with 75 mine safety recommendations in 2006, warned then that continued diligence was necessary because years of improved performance could be wiped out with one disaster. "In the commission report, we were hoping that all the good operators in the country would want to do this voluntarily," Grayson said Thursday. "The good operators would be happy if there was a way to identify the bad players and get them out," he added. CNN's Tom Cohen in Washington contributed to this report.